September is the beginning of Art Season in the High Country and last weekend, Janie Romer and I headed to Santa Fe for a quick, girl’s getaway. Both of us had been working overtime and desperately needed a little break from routine. A Century ago, a group of innovative artists broke with tradition defining a new era in American art. Their work was aimed at expressing the energy, individuality and identity of modern America. The artists who spearheaded that shift are represented in this on-going exhibition with more than fifty masterworks from the turn of the last Century through the 1960’s. 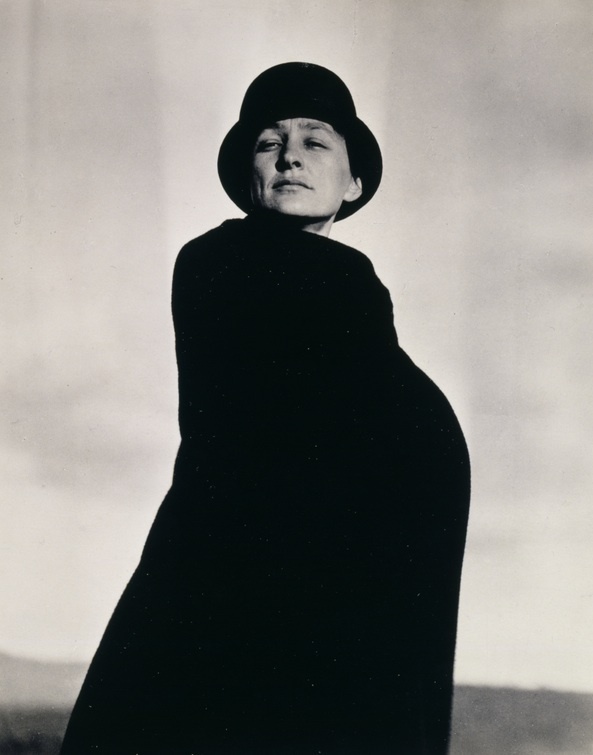 They include Georgia O’Keeffe, Mardsen Hartley, Arthur Dove and Stuart Davis among others. 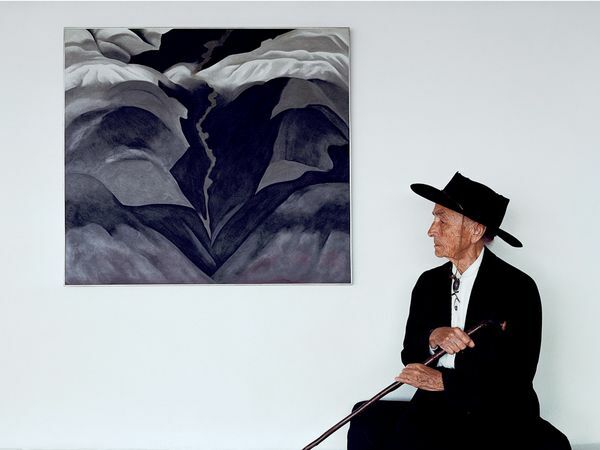 The New Mexico Museum of Art and the Georgia O’Keeffe Museum present The Fall of Modernism, three related exhibitions and programs, between September 2015 and running through January of 2016. At the New Mexico Museum of Art, Georgia O’Keeffe in Process opened on September 11, and tells the story of the artist’s working technique. Preliminary sketches and photographs are shown alongside her finished works. The work spans the artist’s career from the portraits of family members created in the early 1900’s, to paintings she made at Lake George in the mid-teens, to her iconic paintings of New Mexico. We checked into the Eldorado Hotel, which is in walking distance of the Plaza, and were given a tour of the recently renovated property by the very gracious and lovely Debbie Parker, the hotel’s Marketing and Communications Manager. Debbie showed us the O’Keeffe Museum just across from the Hotel’s back entrance. How convenient! The Eldorado is owned by Heritage Hotels, who own the glorious Palacio de Marquesa which was featured here on the blog recently, and have just acquired the El Monte Segrado Resort and Spa in Taos as well. 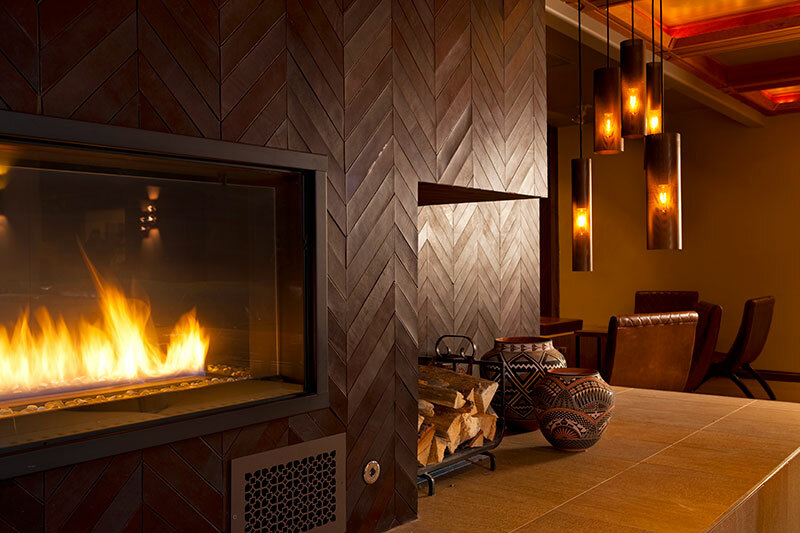 At the Eldorado, Heritage have managed the almost impossible feat of marrying sleek, modern design elements with the traditional New Mexican vernacular, without coming off as either pretentious or ostentatious. We were informed that the owner’s daughter, with the help of an Italian designer friend, are largely responsible for these carefully appointed Interiors. 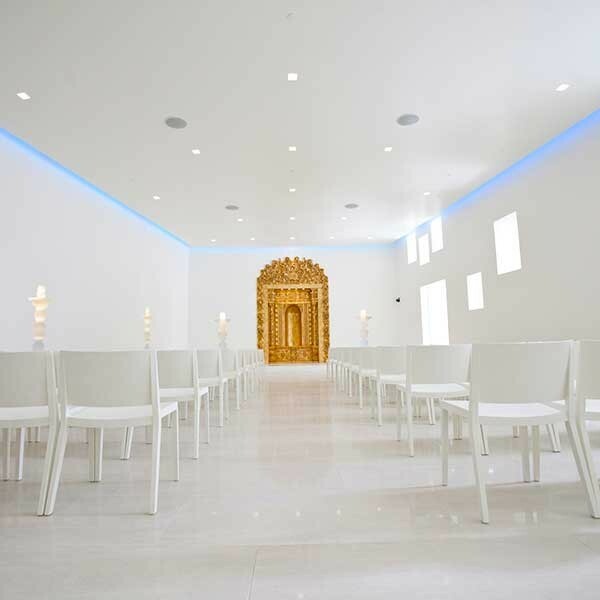 The renovations to the Eldorado are truly impressive; the jewel in its crown, undoubtedly the gorgeous modern Chapel (and adjoining Bridal Suite), with its hand-carved and gilded altar. O’Keeffe would have approved of its stark simplicity. A New Mexico based company, Heritage pride themselves on offering a unique New Mexico experience. Indeed, no expense is spared in any of their properties to ensure an incredibly comfortable stay in understated, yet extremely cosmopolitan and luxurious surroundings. The down pillows and linens were so divine, we didn’t want to leave our room, but Georgia and the Fiesta filled streets of Santa Fe beckoned. Once back at the hotel, we didn’t leave again until we checked out the next day. Why bother? The restaurants are superb. We ate a fabulous lunch in the Agave Lounge and returned to our room where we changed into our bathing suits and the thick, fluffy terrycloth robes provided by the hotel, before taking the elevator up to the rooftop. After a relaxing soak in the hot tub, we went back to our room for a long siesta. We had plans for dinner in the hotel’s new Cava Lounge, but were in no hurry. Janie’s Pulled Pork Sandwich (sans bread, she’s Celiac) and my delicious Angus Burger had completely satisfied us. Anthony Smith, the executive chef (from London) at Heritage Resorts & Hotels has created menus that offer something for everyone, with an emphasis on fresh produce and International Cuisine. We finally made it down for dinner at around 8.45 pm, and thankfully the Cava Lounge serves tapas style, small plates because we were still quite satiated after our hearty lunch. We shared a beautiful plate of cheese, olives and an assortment of charcuterie served with a heavenly Date sauce, along with plates of grilled Shrimp, and perfectly cooked and seasoned Lamp Chops. The service was superb – the staff go out of their way to make you feel pampered and cared for – and the two Spanish guitarists who played throughout our meal, just fabulous! Needless to say we slept like babies, and the next morning were up early, feeling totally refreshed and ready for the drive back to Taos. 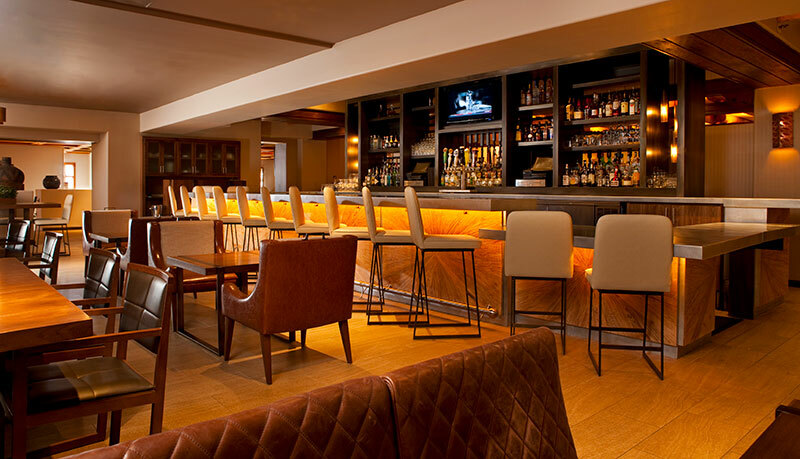 I enjoyed a cup of the complimentary, very good, full-bodied coffee served downstairs in the entry to the Agave Lounge. Janie, being the Englishwoman she is, had tea instead. We were rather loathe to leave this luxurious enclave but real life loomed – Janie and her husband Mark are in the final stretch of renovations to the Stakeout (a Taos landmark), which they bought a year ago, and writing deadlines force me to keep my head down much of the time. As we headed North, we both commented that a night at the Eldorado had magically felt like an entire vacation from real life. 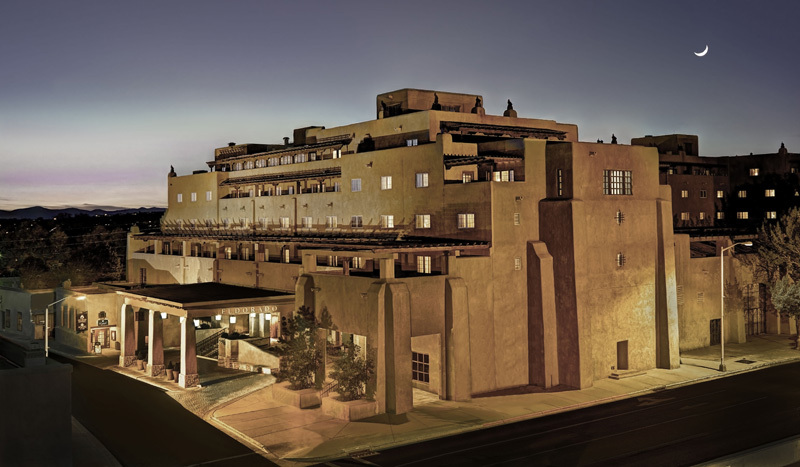 If you are planning a trip to Northern New Mexico this Autumn to see The Fall Of Modernism Exhibit, look no further than The Eldorado for accommodations. And do visit Taos while you’re out here. Both the El Monte Segrado or the Palacio de Marquesa will provide you with Heritage’s high standard of hospitality, ensuring your stay is unforgettable. The Eldorado is world-renowned for its Nidah Spa which we did not have the time to enjoy, but will return as soon as we are able to avail ourselves of their services. There is also a fully equipped gym with saunas in the dressing rooms. The hotel is pet friendly and the entire property, non-smoking. For much more on The Eldorado (and all of Heritage’s properties) please visit their site linked below this post, along with The Fall Of Modernism’s website. 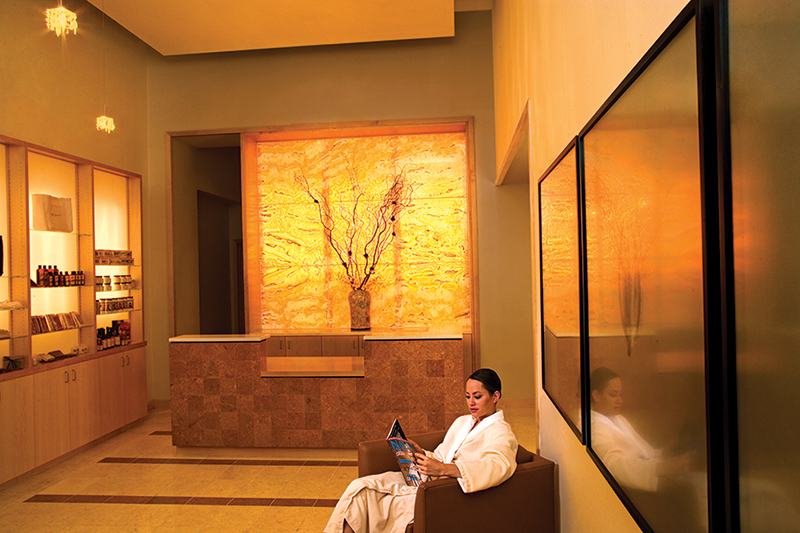 Photograph’s of the Eldorado Interior, care of Heritage Resorts & Spas. Portraits of O’Keeffe, Top by Alfred Stieglitz, Bottom by George F. Mobley.